Four years ago, Samuel Lum ’17 was interning at Bank of America Merrill Lynch. The experience made him realise the central role of finance in businesses, and inspired an academic interest in the field, which he now hopes to pursue as a minor. Students like Lum with alternative academic interests are not uncommon at Yale-NUS. They run the gamut from those with more niche academic interests to others set on particular graduate courses, such as Engineering or Medicine. By the end of their second year at Yale-NUS, students get their pick of 14 majors, from Anthropology to Urban Studies. These 14 majors are intended to cover between them an array of standard majors, such as Economics, and broader, interdisciplinary majors, such as Arts & Humanities and Environmental Studies. While most students will find their major and minor interests among these 14 choices, others with different interests will have to seek out their own academic pathways. As a new college, the number of possible majors at Yale-NUS is inevitably fewer than the number at more established colleges and universities. There are currently 82 possible majors at Yale College, and 65 for undergraduates at NUS. Students who want to explore alternative or niche ideas for their major pathways or minors should speak to relevant faculty who can assist them with planning an appropriate set of courses. Within the current academic framework, these students will have to craft their own pathways through existing majors. For instance, a student looking to focus on dance will do so through the Dance Arts pathway through the Arts and Humanities major. 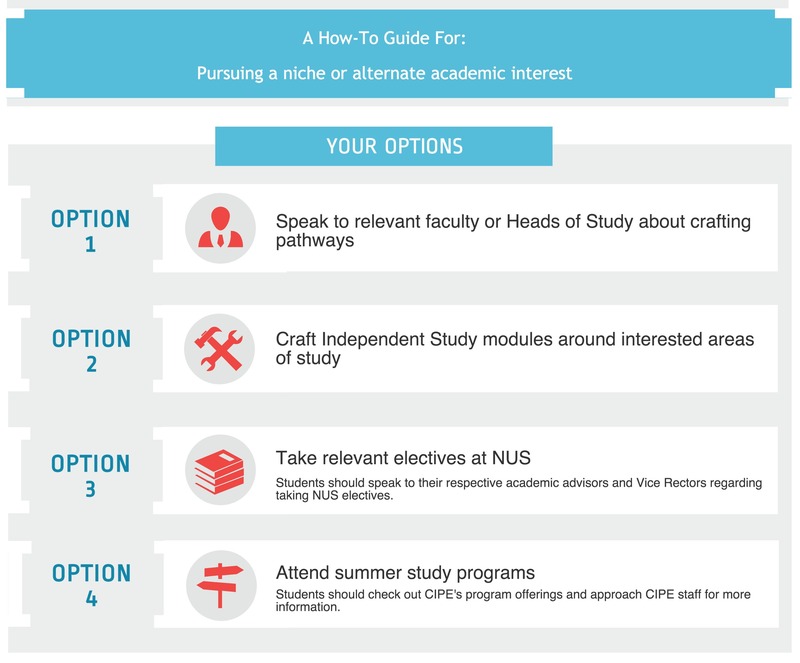 Where possible, students can supplement their academic experiences with relevant electives at NUS, independent study modules, or summer programs. Over the past summer, 30 students from the Class of 2017 attended Yale Summer Sessions. Including those 30, a total of 51 students attended summer courses with transferrable credits through CIPE opportunities, according to CIPE. Creating new majors is not a feasible option in the near future, for the college is relatively committed to building up existing majors. A new major would need to be approved by five academic committees, according to Dean Bailyn. While the general framework is in place, details on many specific pathways remain to be defined. A pertinent concern among the student body is that relevant decisions and faculty hirings will be made only a long time from now, leaving students with less time to explore more fields of study. However, there is a chance students may not need to worry as much after all. “A lot of the faculty hiring over the next six months … is to make sure that the classes we need to teach at the time we need to teach them to get them through their pathways that we think students will want, are actually taught,” informed Dean Bailyn. In building a new college, the student body, faculty, administration and staff have to work closely in order to strengthen the college’s curriculum and policies. Time and patience is needed, but more importantly, so is communication and mutual understanding. Although Engineering is not offered as a major in Yale-NUS, the advice from Head of Study of the Physical Sciences Professor Kang Hway Chuan is that students should speak with him or other science division faculty should they seek to fulfill general requirements for Engineering-related graduate studies. “What is needed for engineering grad school varies from place to place, and also from one discipline in engineering to another, so this needs some working out. I think (interested students and relevant faculty) need to strap down and work out the most suitable pathway. The earlier this is done, the better,” he added. At this point in time, there is no pre-med advisor in the college. However, according to a draft document on medical school advice for Yale-NUS students, those interested in North American post-graduate medical schools or the Duke-NUS Graduate Medical School are urged to visit the Association of American Medical Colleges and Duke-NUS websites for advice and information. The document will be disseminated to the student body once it is ready. Associate Professor of Science Neil Clarke, who taught at the John Hopkins School of Medicine previously, cautions against anxiety over fulfilling prerequisites, “Students are often under the impression that they need to have specific majors to go to medical school. 60% of graduate medical school students did not major in a science at all. Of course, you still need to have taken some college-level science courses and passed the MCAT. Even so, the MCAT is changing right now to reflect the fact that you do not need to have had a highly specialized background in science in order to do medicine.” Professor Clarke suggests CIPE could work with students with medical school aspirations.